FILE - A Pakistani soldier stands in front of closed shops during a military operation against Taliban militants in the town of Miranshah in North Waziristan, July 9, 2014. Participants at an informal international meeting Friday in Pakistan recommended the United States open direct talks with the Taliban insurgency to help promote a negotiated settlement to the deadly Afghanistan war. Current and former Afghan and Pakistani parliamentarians, diplomats, military officials and Western scholars attended the two-day "Track-II" dialogue in Islamabad to exchange views on how the warring parties should approach the long-sought peace process. "The U.S. should engage in talks with the Taliban. This will not harm the Afghan government in the current peace process," said a statement issued after the meeting. The Islamabad-based Regional Peace Institute, in collaboration with the Royal Danish Defense College, organized the unofficial dialogue. 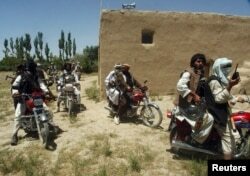 FILE - Taliban fighters ride on motorbikes in an undisclosed location in Afghanistan, July 14, 2009. Participants emphasized that intelligence-sharing between Kabul and Islamabad, with Washington joining the process, would be required to help start peace talks with the Afghan insurgency. Friday's unofficial meeting in Pakistan emphasized that a peace deal between the Taliban and the Afghan government would require both sides to make "unpleasant concessions" for the ultimate success of the negotiations. Senior Taliban leaders allegedly are sheltering in Pakistan, and Afghans, along with their U.S. partners, have been calling on the neighboring country to use its influence and bring the insurgents to the negotiating table. Pakistani officials maintain they have limited influence over the Taliban and "that, too, has receded over the years. For its part, the Taliban has been demanding direct talks with Washington, dismissing the Kabul government as an American puppet." U.S. officials have turned down the Taliban's repeated calls for negotiations, insisting the peace process must be Afghan-led and Afghan-owned. The Taliban and the Afghan government earlier this month observed a mutual three-day cease-fire during the three-day annual Muslim festival of Eid al-Fitr, the first cessation of hostilities in the 17-year-old war. The temporary move had generated hopes for the opening of peace talks between the two sides. The Afghan government unilaterally extended its weeklong cease-fire for 10 days, and it is due to end Saturday. But the Taliban rejected calls for extending its cease-fire, insisting it would hold talks only with the U.S. The insurgents have killed scores of Afghan security forces since ending their three-day cease-fire on June 17 and resuming battlefield attacks.